Every morning I get up, see my husband off to work, and then go, as my husband lovingly refers to it, "stare at my garden"... trying to notice subtle changes in leaves, fruits, etc. Assessing what will be next to make it to the dinner table. Inspecting, weeding, watering, etc. The other day when I went for my routine garden-staring session, I saw what appeared to be bug-poop on a few leaves. 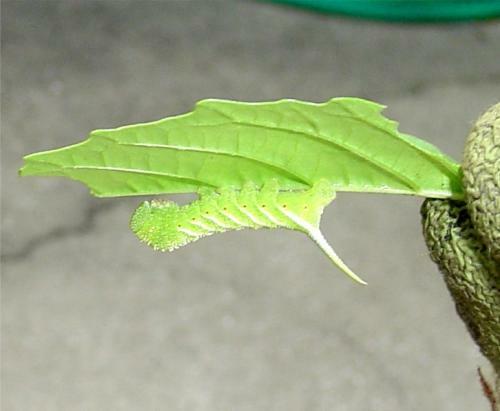 By looking at the leaves above, I found a giant wormish caterpiller-thing under a leaf (see pic). 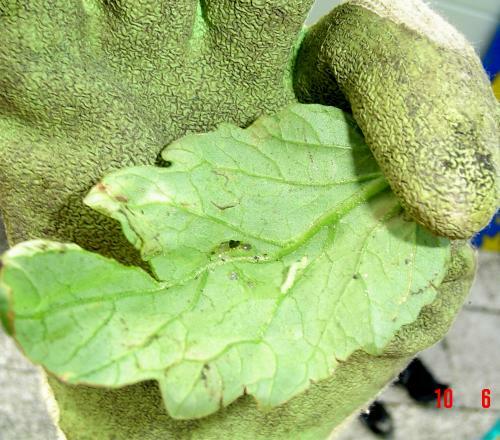 The next day, I found a few little tiny inch-worm-looking guys under the leaves on two other kinds of plants. The day after that, I noticed strange holes in more leaves! I've been spraying with pesticides ever since I found the leafminers & aphids a few months ago. So why is this happening to me?! My poor plant-babies!! Any suggestions, guys? I've been using Ortho spray for veggies and Sevin dust. Am I missing something? Even if you don't know how to get rid of these damning creatures, can you identify them so I can find some way to get rid of them? Please? The caterpillar looks to be a Tomato Hornworm. Unless you have dozens of tomato plants you can easily check both sides of the leaves and pick them off. The small white wormy things could be the freshly hatched larvae of the hawk moth the caterpillar becomes. TOMATO HORNWORM....I hate them! But you can get rid of them. Just be patient and diligent. That is a link to Bacillus thuringiensis. It is a natural chemical that gives the worms a disease and then they die. You buy it in diluted form, mix it and put it in a spray bottle. It works great. You can buy it at good garden store. I bought my online. You also have to be diligent picking off the caterpillars and killing them. They will eat a plant in a day and will eat the tomatoes as well.